As one of the leading job creators in the United States and the economic backbone of America, middle market companies are looking to grow their businesses but feel greater attention needs to be paid to the policies that directly affect their companies and their concerns on Capitol Hill. NEW YORK--(BUSINESS WIRE)--Middle market executives, whose companies take in more than $6 trillion in revenues and employ more than 30 million people annually1, are expressing renewed optimism in their business prospects compared to a year ago. However, despite this positive outlook they are concerned about potential tax increases, government regulations, compliance with the Affordable Care Act and the current strength of the U.S. and global economies. 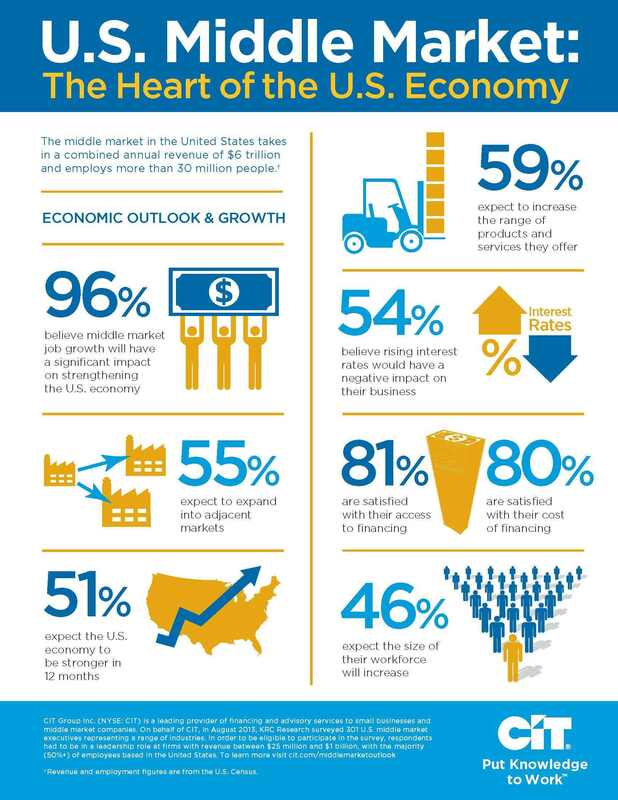 These are just a few of the findings contained in a new study, CIT: Voice of the Middle Market – Perspectives from the Heart of the U.S. Economy (cit.com/middlemarketoutlook), released today by CIT Group Inc. (NYSE:CIT)cit.com, a leading provider of financing and advisory services to small businesses and middle market companies. Better off Today than Yesterday: The majority of middle market executives report that their companies are in a strong position today (60%). In addition, many remain optimistic with 55% saying they are better off today than compared to a year ago. Top Concerns Are Taxes and Compliance with Affordable Care Act: However, the optimism of middle market executives is not without its challenges. While most are worried about economic uncertainty in the United States and globally (81% and 70%, respectively), there are also concerns about potential tax increases (74%), compliance with the Affordable Care Act (70%) and compliance with government regulations (66%). In addition, 54% said they believed rising interest rates would have a negative impact on their business. Uncertainty and Talent Management: Looking ahead to the next 12 months, middle market executives express concern about talent management with 59% concerned about their ability to retain top talent, and 60% with their ability to hire top talent. Focused on Growth and Expansion: Respondents report that over the next 12 months their companies are likely to: increase the range of products and services they offer (59%); expand into adjacent markets (55%) and increase the size of their workforce (46%). Displeasure with Capitol Hill: A significant majority of middle market executives agree that middle market job growth will have a significant impact on strengthening the U.S. economy (96%). Despite this, 83% believe Congress is doing too little to support the middle market; while 95% disapprove of the job performance of Congress and 70% disapprove of the job performance of President Obama. Overall, two-thirds reported disapproval of the job performance of both Congress and the President. Balancing the Budget: Indicative of their lack of optimism in the strength of the U.S. economy and overall poor job performance rating for Congress, a vast majority of middle market executives (80%) reported that balancing the federal budget will have a significant impact on their business. Satisfaction with Financing: Overall satisfaction with financing remained high. Eight in ten middle market executives (81%) report that they are satisfied with their company’s access to financing, as well as the cost of financing for their company (80%). Most also say that they are satisfied with the variety of financing alternatives available to their company (79%). Putting Capital to Work: With satisfaction remaining high about their access to financing, middle market executives expressed plans to put that cash to work for working capital purposes (35%), by investing in plant and equipment (34%) and financing acquisitions (30%). Additional information about CIT: Voice of the Middle Market: Perspectives from the Heart of the U.S. Economy, including the full executive report, infographics and related materials, can be found at cit.com/middlemarketoutlook. 1 According to U.S. Census data. KRC Research, on behalf of CIT, fielded an online survey among 301 U.S. middle market executives representing a range of industries. Researchers conducted fieldwork in August of 2013. In order to be eligible to participate in the survey, respondents had to be in a leadership role at firms with revenues between $25 million and $1 billion, the majority of whose employees were based in the United States. Researchers defined leadership roles as: Owner, Board Member, C-Suite Executive (Chief Executive Officer, Chief Operating Officer, Chief Financial Officer, Chief Information Officer, Chief Investment Officer, or other C-Suite title), or SVP/VP/Director.